Welcome To Early Computer Central.com! This is an independent informational site covering early computers and related materials. Items presented here are in-depth, but in laymen's language. Technical jargon is explained. 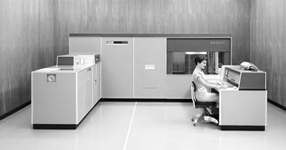 IBM introduced the 305 RAMAC (Random Access Method of Accounting and Control) computer in September 1956, which was the first computer to include a hard disk drive - the IBM 350 Disk. 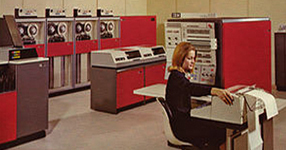 Prior to this time, magnetic computer storage had consisted of core memory, tape, and drums. The 350 Disk was viewed as a replacement for the drum. IBM sold over 1,000 RAMAC systems. 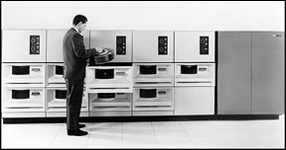 The announcement of the IBM System/360 was revolutionary. It replaced all five of IBM’s previous computer product lines with a family of six new processors. The six processor models offered a performance range of 50 from the bottom to the top of the line. The software package included network communications capabilities, 16 language compilers, and a disk-based operating system. 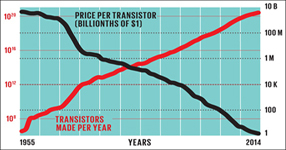 Doubling the number of transistors in a processor every two years is an exponential progression and after many, many years it has shown no signs of stopping. Today, it describes a remarkable 50 year streak that has given us countless forms of computers, smartphones, and other devices. The impact of Moore’s Law on modern life can not be overstated. 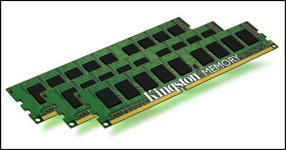 Random Access Memory (RAM) has become a generic term for any semiconductor memory that can be written to as well as read from. All semiconductor memory has the property of random access, which means that it takes the same amount of time to access any memory location. RAM data can be efficiently accessed in any random order. The IBM 2314, part of the IBM/360 System, was very different from previous models. The 2314 had the capacity to store 29 megabytes of data in a single pack, and the disk packs could be removed and stored. The 2314 used a disk pack that was different from the 1311. The 2316 Pack contained eleven 14-inch diameter disks each with 200 tracks.